are deceased. The father died in Grundy county in 1867 and the mother in Chicago in the spring of 1897. Mr. Hagerty was reared in Illinois, and in the spring of 1879, in company with William Laughlin and family, came to Custer county, Nebraska afterward taking a homestead on the southwest quarter of section thirty-four, township twenty, range eighteen. He was married in Ord, September 23, 1884, to Miss Vida Tobias, a native of Tazewell county, Illinois, and daughter of Israel Tobias and wife, who took a homestead in Custer county in 1879. They made their first home on the homestead, which was located near Sargent, and soon afterward Mr. Hagerty became assistant cashier of the Custer County Bank, the first bank in the county. After proving title to his claim, he moved to Sargent, which remained his home until 1895. He then removed to Utica, Illinois, where for five years he conducted a grain business. Returning to Sargent in 1900, he formed a partnership with A. L. Conhiser, and they opened a general store. Mr. Hagerty soon purchased the interest of his partner, and carried on the business until the latter part of 1910, when he retired from active business. He and his wife have a fine modern home, and have many friends and acquaintances in Sargent. He is one of the directors of the First National Bank of Sargent, and is interested in various other enterprises. He has always supported the best interests of his county and state, and has helped build up useful enterprises in the region where he has lived so many years. During his early years in Nebraska he taught in the public schools, during the second and third years being employed in Custer county. He has witnessed the wonderful growth and development of central Nebraska during the past thirty-two years, and has done his share to help in the general progress. Four children were born to Mr. and Mrs. Hagerty: William F. and Leroy W., living at home, and two who are deceased. One of the earliest of the old settlers, or rather one of the oldest of the early settlers, still living in Cedar county, Nebraska, is the venerable Amos S. Parker of Hartington. He came in the early days, when ox teams were the only means of transportation, intervening part of the way between the frontier and the western terminus of the railroads, three hundred miles to the east. Over this distance he plodded along afoot with several companions returning to their eastern homes after their prospecting journey to Nebraska plains. Mr. Parker was born in the town of Dalton, Coos county, New Hampshire, April 29, 1835, a son of Amos and Nancy (Pay) Parker, both of Yankee birth and breeding. He received the practical education of New England lads, and on attaining his majority, made a trip to the west. He was a member of a surveying party in northern Wisconsin, and came on to Nebraska. Starting for Cedar county, September 5, 1857, with two yoke of oxen, from Dubuque, Iowa, they were one month on the way, reaching the now deserted village of Waucapana, in Cedar county, June 17. On October 19 the same party started back east on foot, as their funds were low, and they kept to the roads for over three hundred miles. At Independence, Iowa, they took the stage for Dubuque, and then traveled by rail back to New Hampshire. Of these four men, Mr. Parker is the sole survivor. While at his eastern home, Mr. Parker was married on the last day of the year 1857, and in the spring following, started for the frontier wilderness with his bride. It took courage for a woman, just out of girlhood, to leave comfort and safety in the old home, and travel thousands of miles to an open wilderness, where hostile bands of Indians were still roaming, and occasionally committing depredations. A horrible massacre was actually committed within a few miles of their home six years after their settlement in the county. They journeyed by rail to St. Louis, and traveled thence by boat to Sioux City, Iowa. They left on the 18th of March, and arrived at Sioux City the 11th of April, spending three Sundays on sand bars. At Sioux City Mr. Parker left his bride and came out to the settlement alone, reaching Waucapona March 17. In June, Mr. Parker secured an ox team, drove to Sioux City, and brought his bride to her new wilderness home. Here they lived happily until the Indians began their depredations, when Mr. Parker, growing uneasy, sent his wife and child back to their New Hampshire home for two years. She left Yankton, August 9, 1862, and reached the town on her return, August 9, 1864, just two years to a day separated them. Mr. Parker preempted on a piece of timber land near St. James which was the first claim under the law ever perfected in Cedar county. He lived on this tract until April, 1861, when he moved to Green Island, and was farming here until the time of the great flood of March, 1881. When the danger from the rising waters became imminent, Mrs. Parker took her children to a sister's, further from the river, and on higher ground. In going there, they were compelled to cross several sloughs, through which water was already running, on the deep snow drifts and on fences, Mr. Parker wading beside them to keep them from falling into the icy water. He returned to the home, and remained there until the crest of the water was within two feet of the second story ceiling, when a neighbor reached him in a boat, and brought him off to safety. One may imagine his discomfort, with clothing saturated with ice-cold water. For four days, one hundred and ten people found refuge in one small house, eating and sleeping in turns as they could. But such is western hospitality and their spirit of helpfulness that all were made welcome by Mrs. Parker and her sister. After his own rescue, Mr. Parker went to the relief of others in like peril, and saved some of them from a watery grave. When the waters subsided and all decided to abandon Green Island, as floods were likely to occur again, a settlement was made at Aten, and here Mr. Parker removed his house, and rebuilt it into a hotel, the first in the village, which he kept until 1900, when he removed to Hartington. He has engaged in market gardening here since coming to town. Being endowed with Yankee energy, he cannot be content to sit idly by. Mr. Parker was married in Coos county, New Hampshire, December 31, 1857, to Miss Mary N. Lowd, who was born in the town of Dalton Coos county, New Hampshire, January 26, 1835 a daughter of Benjamin and Betsy (Marden) Lowd, both natives of the mountain state. Mr. and Mrs. Parker are the parents of four children: William B., who resides near Wellington ing several carloads of honey every year ; Mary O., is the wife of Frans Nelson, for many years president of the First National Bank of Hartington, and now head of the Commonwealth Insurance Company in Omaha; George I., succeeded Mr. Nelson as president of the bank, and resides in Hartington; and Sadie, wife of John J. Nohr, who resides on a ranch near Morris, Colorado. Parents who have reared a family of such excellent children, and have seen them so well established, are a credit to the state and nation; to them all honor is due. Mr. Parker is independent in politics, voting for the man he considers best fitted to serve the public, regardless of party lines. The many blizzards of the early days were made light of by the early settlers, and many are the times they were out for hours in the blinding, icy blasts. In the blizzard of January 12, 1888, Mr. Parker had hitched up, and was ready to start on a drive, when the storm broke. For several days after, he was kept busy shoveling the drifting snow from his barns and sheds to keep his stock from smothering. After returning from her two years' sojourn in New Hampshire, Mrs. Parker experienced little trouble from the Indians though at one time they crowded into her house as thickly as they could stand, demanding that she feed them. Provisions for such a crowd she had none, so she drove them from the house, saying ''puncachee,'' meaning in their language, begone. Mrs. Wiseman, who had gone to Yankton for provisions at the time her children were killed, spent the night before their massacre with Mrs. Parker in her house. During the time of his wife's absence, Mr. Parker lived at Yankton part of the time, and was in a small party who went with the owner of a saw mill there, to Sioux City to get missing parts of his own mill from that of a mill at Sioux Falls, the owner of which had been driven off by the Indians. The town was deserted, and on that drive of eighty miles and return, not a human being was seen, all having been driven out by the hostile Sioux. Mr. and Mrs. Parker are among the last left of the earliest settlers, but are hale and hearty, and it is hoped will be with us for years to come. Joseph B. White, whose biography forms an interesting page in the history of the early settlement of Nebraska, is a resident of Central City, Nebraska, where he has become widely and favorably known. He is one of the energetic and prosperous citizens, and enjoys a pleasant home and many warm friends. Mr. White was born in New York state July 24, 1837, and was sixth of seven children in the family of Joseph and Sarah (Sprague) White who had four sons and three daughters. Joseph White, Jr., in his seventeenth year, went to Blackhawk county, Iowa, to the town of Waterloo, which was his home place until 187l. Mr. White learned the masons' trade, and followed that occupation until his retirement from active work several years ago. In 1861 Mr. White enlisted in company I Third Iowa volunteer infantry, and was mustered out in February, 1864. Mr. White at the time of being mustered out, was in company C Thirty-first Iowa volunteer infantry as a noncommissioned officer. After being mustered out he re-enlisted. During the war he participated in many of the notable battles and engagements and was with Sherman at Chickasaw Bluffs, at the capture of Fort Hindman in Arkansas the siege of Vicksburg, and in many other engagements and skirmishes. He is an honored veteran of the civil war, with an enviable record. After being formally mustered out, he returned to Blackhawk county, Iowa, again taking up his trade. Mr. White was married to Miss Laura Ann O'Neill in Waterloo, September 27, 1865, and in April, 1871, Mr. and Mrs. White and three children moved Lone Tree, Merrick county, Nebraska now known as Central City. Mr. White from that time engaged continuously in his trade of master mason and builder. has one child, and lives in Grand Island, Nebraska; Elizabeth, wife of David Jackson, has two children, and resides in Pratt, Kansas; Laura, wife of Sid Baird, lives in Grand Island, Nebraska; Hattie, wife of Bert Hughes, has two children, and resides in Colorado; Rose, married to James Danks, has one child, and lives in Dakota; Josie, wife of Albert Miller, has one child, and resides in Lincoln, Nebraska; Arthur, married, has two children, and lives in Central City; Daisy, wife of David Green, has two children, and lives in Wallace, Idaho. Mr. and Mrs. White have twenty-one grand children. Mr. White has seen Central City grow from nothing to its present position as one of the most desirable residence cities in Nebraska. Mr. White is a republican, and has served on the city council of Central City for many years almost continuously, of which he is now president. He is also a Mason of high standing, and in earlier years served as justice of the peace in Lone Tree township. Mr. and Mrs. White live in their pleasant home in Central City, and enjoy the respect and esteem of a large circle of friends. While the west is full of self-made men, few have succeeded so well from such small beginning as has Frank Nelson, the genial banker and financier of Niobrara. Mr. Nelson was born in Christianhamn, Sweden, August 13, 1854, and remained there with his parents until his thirteenth year, when the entire family emigrated to America, crossing the North Sea from Gottenburg to Hull, and proceeding to Liverpool by rail, there embarking in a vessel for New York. Their first stop was at Moline, Illinois, where some friends had located, and from there they went to Keokuk, Iowa, remaining for several years. Frank secured employment in quarrying and blasting stone, in building the canal and the lower lock in the river, and later returned to Moline, where his superior knowledge of quarrying and blasting soon advanced him to the superintendency of this branch of construction on the waterpower plant which the government was erecting between the main shore and the island of Rock Island. In the fall of 1870, the father and mother moved to Nebraska, settling on a farm in the northwest quarter of section twenty-eight, township thirty-two, range two, and Frank joined them there in February of the following year, helping get their farm started in their new location. For the first few years they had bad luck with crops and often it was difficult to even procure sufficient food for the family. About this time our subject was married, and started for himself. He tried farming, and managed to make a living, but lost everything he had by prairie fires. After a time, he purchased a piece of timber along the Missouri river, and opened a woodyard, supplying fuel to the steamboats that plied the stream, and continued in this business until the fall of 1879, at which time he returned to his farm, and resided there up to 1885. In the fall of 1875, he was elected county commissioner, his nomination being made a few weeks prior to his coming of age. He served in this capacity for six years, and later as county clerk for a like period. In 1890 he bought a third interest in the Niobrara Valley Bank, and was elected vice president of the institution, and six years later obtained a larger interest, being made president. Since that time he has been widening his operations along the line of the Northwestern railroad, purchasing banks at Cross, Bristow, Verdel, Lynch and Monowi. The first two he has since sold, but retains the management of the others, which comprise a perfect chain of strong financial institutions tributary to the parent bank. Mr. Nelson married Martha B. Lee in 1879. She is a native of Knox county, a daughter of Alfred Lee, who was one of the earliest settlers in Nebraska. Mr. and Mrs. Nelson have four children, as follows: Marion C., associated with his father in the banking business at Niobrara; Harry L., in charge of the bank at Verdel; Winnifred B., a graduate of the Niobrara High School, also of the Convent of the Sacred Heart at Omaha, class of 1907; and Howard, who is a student of St. John's Academy near Milwaukee, Wisconsin. Mr. Nelson is a republican, and one of his party's "wheel horses'' in this part of the state. He was a member of the national convention that nominated our strenuous president in 1904. Mr. Nelson has been a member of the Masonic fraternity since 1887, and has attained to the thirty-second degree of Scottish Rite Masonry, crossing the hot sands of the desert in Tangier Temple of the Mystic Shrine in 1887. With Mrs. Nelson he is also a member of the Niobrara Chapter of the Order of the Eastern Star. at Balabac; Mrs. James D. Courtney, of Omaha; Mrs. William Crinklaw; Mrs. Granville Ivers, of South Dakota. The father of these children was a native of Ohio, born near Cincinnati, and of German descent, and the mother was born in New Orleans, where they were married, and was of French parentage. He was a civil engineer by profession; settled in Cutter county about 1884-5, and died on his homestead in January, 1888. His widow died in Lincoln, May 13, 1911. In infancy Similien L. Perin accompanied his parents to Davenport, Iowa, and soon afterwards to Council Bluffs. At this time the father surveyed a large part of eastern Nebraska. While the boy lived in various parts of Iowa and Nebraska, he received most of his education in the former state, where most of his early life was spent. In the spring of 1879 he came to Custer county, looking for a place to locate and homesteaded one hundred and sixty acres of land and a tree claim of like size adjoining, on sections ten and eleven, township nineteen, range eighteen. He began plowing the virgin soil on his land that summer, and also broke land where the town of Sergeant was afterward located. In the fall of the year, he returned to Iowa to spend the winter season, and the following spring brought his two brothers, S. W. and A. Z., with him, making the trip with covered wagons and bringing with them horses and cattle. In June 1882 at Ord, Nebraska, Mr. Perin was united in marriage with Miss Sophia Tobias, a native of El Paso, Illinois, and the first teacher in the school at West Union, Custer county. They established their first home on the Custer county homestead, their nearest trading point then being Grand Island, one hundred miles distant. Later, when the country began to be more settled, Mr. Perin moved to the south side of the river in order that he might have the benefit of better feeding privileges for his stock. He was obliged to meet many inconveniences and hardships in those days, and when going for supplies found it hard to cross the river, as there was no bridge constructed until he had lived in the locality four years. He was instrumental in organizing school district number eighty-eight, and served many years as a member of its board. In the fall of 1900 when the railroad was constructed through Sargent, Mr. Perin moved to that town and opened a hotel, later conducting a station of the Beatrice Creamery Company there. In 1905 he was appointed postmaster, and still holds that office. He and his wife have had four children: Harold I., married, and living in Sargent; Louis E., assistant manager of Dierk's lumber yard in Sargent ; Willis W., at home and Vida who died at the age of three years. Mr. Perin always public-spirited, lent his aid in the support of the progress and development of the central part of the state. He and the other members of the family have taken an active part in social and religious circles. He is a prosperous and successful business man, and owns two hundred and fifty acres of land adjoining the town of Sargent, besides good city properties. 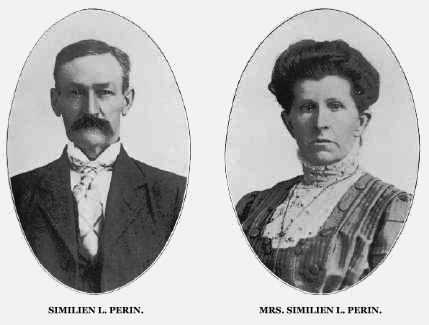 Mrs. Perin is a daughter of Israel C. Tobias and wife, early settlers of Custer county. Portraits of Mr. and Mrs. Perin appear on another page of this volume. Similien L. Perin -- Mrs. Similien L. Perin. Augustus F. Kliese, who holds the office of county judge of Nance county, Nebraska, is a gentleman of brilliant, intellectual attainments and exceptional business ability, and who, during his career as leader of affairs, has proven himself highly worthy of the confidence imposed in him by his fellow men. Judge Kliese is a native of Prussia, born March 14, 1839. He was the eldest of six children in the family of Frederick and Fredericka Kliese. When Augustus was a lad of four years, the entire family came to America, their first settlement being made in Milwaukee, Wisconsin, where the father and mother remained for five years, and then moved to Watertown, Wisconsin, where the mother died about 1852, after which the father moved to Washington county, Wisconsin, where his death occurred in 1901. Our subject remained in Wisconsin up to 1858, at that time enlisting in company F, First United States infantry of the regular army, going with his company to Texas on frontier service. After two years spent in that part of the country, he returned to Wisconsin, and in 1862 enlisted in company A, Twenty-second Wisconsin volunteer infantry, seeing active service for over a year, then was discharged, and received the appointment of second lieutenant of company B, Seventeenth United States volunteers, colored troops. On February 6, 1864 he was promoted to first lieutenant company E, of the same regiment, serving as such up to October 26 of the following year, then received his commission as captain of company F, of his regiment, filling this office up to April 25, 1866, when he received his honorable discharge from the army at Nashville, Tennessee. He was on continuous duty for over four years, gaining the reputation of being a most faithful and conscientious man in the service, taking part in numerous battles, during which he never received a severe wound. time coming to Nance county, Nebraska, where they have resided ever since. Our subject has been engaged in different lines of work since locating here. He carried on an implement and furniture business in Belgrade for ten years. He has been a leader in public life during his residence in the region, and in the fall of 1907 was elected to his present office. Judge and Mrs. Kliese have had nine children, six of whom are now living, all married, and filling honorable positions in life. They are named as follows: Edward A., Lottie A., Alice A., Mary E., John L. and Hattie B.
Hon. Hugh A. Allen of Atkinson, twice the representative of his district in the Nebraska legislature, came to the state in February, 1884, and settled on a quarter section of good land, seven miles northwest of Atkinson. The following year he sold that tract, and moved into town, engaging in the real estate business, and since that time he has bought, sold and traded thousands upon thousands of acres of Holt county land, and has prospered in this enterprise to a gratifying extent. Mr. Allen was born near Danville, Vermillion county, Illinois, October 5, 1849, was reared on a farm southeast of Rossville. About the time he reached his majority, he went to Hoopeston, where for about fifteen years he was employed at various kinds of labor. However, seeing small prospects for acquiring a competency in his native state, and learning of the opportunities offered in the west, through the reports of his father, who had moved to Nebraska in 1882, he followed his parents to Holt county, and settled on the farm above mentioned. He is a son of William I. and Emily (Newell) Allen, who is included in the circle of relationship to Ethan Allen of revolutionary fame. The father is a native of Burlington, Vermont, and the mother of Kentucky. The parents came to Illinois in the forties, and lived in that state until their coming to Nebraska in 1882. Upon coming to the latter state, they settled in Cherry county, where they lived until 1891. Mr. Allen was married (first) in Holt county, in 1887, to Mary E. Logan. His second marriage took place in Lancaster county in 1905, when he was united with Mrs. Adelaide Spencer, who, by her former marriage to Simeon K. Spencer, had a daughter, Natalie, now a pupil in the Atkinson high school. In politics Mr. Allen is a Republican, and in 1908 and again 1910 was elected to represent his district in the state legislature. He has been successful in a business way since coming to Nebraska, and has been able to acquire a competency that will keep him in comfort when old age shall overtake him. He enjoys the full confidence of his neighbors and fellow men, and his course of action in his public life during the year 1909 was such as to commend him for a second term, which he began in the session of 1911. He is always to he found supporting measures for the benefit of the common people, of whom he considers himself one, and lie understands them and their needs, as they in turn understand him, which accounts for their endorsement of him, and their support for a second term of office. Mr. Allen is a member of the Methodist Episcopal church, and, fraternally, belongs to the Masons and the A. 0. U. W.
When he first came to Nebraska, deer were still to be seen on the prairie, though the buffalo had been driven farther west. Many of the settlers in those days used hay for fuel, but he never did so. Prairie fires were of frequent occurrence in the early days, and among the worst he ever assisted to fight was one that threatened a neighbor's buildings. With two other men, Mr. Allen worked to save this property, and at the time of doing it they were in imminent danger themselves, having to wrap their heads in wet blankets in order to enable them to get close enough to the fire to work effectually to extinguish it. He has witnessed a remarkable change in conditions and surroundings since coming west, and has borne his share in promoting the general welfare and advancement of his community. Daniel J. Poynter, editor and publisher the Argus at Albion, Nebraska, is one of the best known professional and business men of his county and state. Our subject was born in Woodford county Illinois, on June 4, 1857, and was the youngest three children in the family of William C. and Hulda Poynter. Daniel J. Poynter is the only member of the family now living. His father was always active along religious lines, a member of the ministry, and an elder in the Church of Christ for fifty years in Illinois, coming to Nebraska in 1888 in order to be near his sons, W. A. and our subject, who had settled here. He died in Albion on Christmas day, 1899, and his wife's death occurred in Albion in 1908.
called populist, ticket, and two years later re-elected to the same office by a handsome majority. He is one of the original Farmers' Alliance men of Boone county, and up to the present time has been a wide-gauge man with populistic tendencies. He is an active worker along educational and moral lines, enjoys a statewide acquaintance with well-known men, and has the esteem of all. Mr. Poynter was really the organizer of the Church of Christ and Sunday school in his community while still living on the farm. He started a class, with the help of his brother, W. A., at the Rozelma school house shortly after locating in the county, and from this, the movement grew to a well-established church with a wide attendance, and this portion of his life has been his greatest pride. Mr. Poynter came into control of the Argus plant in April, 1898, and this paper has always been an advocate of the best interests of Boone county. It enjoys a large circulation as a weekly, is housed in a fine brick block, and has a splendid, modern equipment for the prompt and proper execution of all orders received. Mr. and Mrs. Poynter have two children, Irene and John F., both married and living in Boone county. Mr. Moses was born in Ashtabula county, Ohio, July 12, 1830 was a son of Jonathan Moses, whose immigrant ancestor, John Moses, came to the colonies in 1632, and from him sprang the branch of the family to which Halsey H. Moses belongs. The father was born in Norfolk, Litchfield county, Connecticut, as was the mother, Abigail Plumleigh. The father died in 1841, at the age of sixty-one years, and the mother died in 1856, at the age of sixty-six years. They came to Ashtabula county, Ohio, in June, 1814, settled on a farm, and there lived out their days. The property has never since gone out of the family, nor has it passed into the hands of even the third generation. An elder brother, Harlow Moses, owned it until he was ninety-two years old, when Mr. Moses purchased the old homestead, and his younger son now occupies the farm. His first dwelling was a log house, but he soon built a commodious frame dwelling, which is still in a good state of preservation. Mr. Moses was reared in Ashtabula county, eight miles from the home of the famous Joshua R. Giddings, who, by the way, was one of the committee to examine Mr. Moses for admission to the bar. He had read law in the office of A. L. Tinker of Paynesville, and in August, 1851, a few weeks after attaining his majority, Mr. Moses was admitted to the bar, after an examination as to his proficiency by a commitee composed of Joshua R. Giddings, Benjamin F. Wade, Judge Horace Wilder, Judge Laban Sherman and Judge Darius Caldwell, all prominent men in their time, of the Ohio bar. Opening an office in Astabula, he was an active member of the bar until 1862. The next ten years he was located in Warren, Trumbull county, and from that time until the spring of 1888, when he retired from practice and came west, he was a leading member of the bar in Youngstown, Mahoning county, where he attained no little eminence as a man of wide learning in his profession. One of the standard text books of the profession is "Moses on Mandamus," which has been a recognized authority on the subject since its publication in 1866. An anecdote is related of Ingersoll, who was making liberal use of the volume in a case before Judge Blodgett of Chicago. His reply, not overly pious, assured the judge that the Moses who wrote of mandamus was not the Moses to whom he referred in one of his famous lectures. It was while living in his native county that Mr. Moses had office thrust upon him. His neighbors secured his appointment under President James Buchanan as postmaster of Rock Creek, the arrival of the commission being the first notice he had of the honor. He qualified, appointed a deputy who attended to the mails, and continued to give his attention to the legal profession. Mr. Moses was married in Ashtabula county. in 1852, to Miss Jane Murdock, a native of Mesopotamia, Ohio. She died in November, 1906, at the age of seventy-eight. Of their four children, two sons survive. Franz E., occupies part of the farm near Wayne. He graduated from the college at Hiram, Ohio, and then took the engineering course at Raines' Seminary, Youngstown, Ohio. Since coming to Wayne county he has served a term or two as county surveyor. Franz Moses was united in marriage to Miss Martha Johnson, to whom two sons and two daughters have been born. Halsey S., is engaged in stock dealing and breeding on part of Mr.
Moses' big ranch; Edith, is the wife of Chester Chubb, of Michigan City, Indiana; Martha, an expert stenographer and china decorator, is employed at Crete, Nebraska; Irving, is in partnership with his brother on the ranch. Mr. Halsey H. Moses' younger son, Hosmer, is married, and occupies the old homestead in Ashtabula county, Ohio, that has been in the family nearly a hundred years. Mr. Moses has been a life long democrat although not a narrow-minded one he will not support an unworthy candidate on his own party ticket if a better one opposes him. He has been a Mason since early life, having been raised to the Master's degree in the lodge at Warren. Since 1903, Mr. Moses has spent the winters in Pasadena, California, leaving for the sunny flower-land about the middle of November, and returning when the weather is settled in the spring. A man of four-score years, he is as active in mind and body as one of three-score or less, and gives promise to rounding out an even century. The gentleman whose name heads this review comes from a family of the oldest and best-known settlers of Platte county, Nebraska, who have always served their county and state to the utmost. L. Fred Gottschalk, son of Frederick and Margetha (Loy) Gottschalk, was born in Columbus, Nebraska, April 30, 1864, and was the second of three children, and is the only one now living. his parents are both deceased, the death of his mother occurring May 31, 1901, and that of his father August 18, 1905, at Columbus, Nebraska. Mr. Gottschalk received his elementary education in the home schools, and in the years of 1885-86-87-88 was a student at Ann Arbor, Michigan, studying along the lines of civil engineering. The five years following student life, he was engaged with Ann Arbor city engineer, and afterwards he was engaged in construction work for various railroads, his last employment being heavy rock work on the Union Pacific railroad through Wyoming. In the early nineties he spent nearly two years in the mountains of Kentucky, surveying for a land syndicate, during which time much trouble was experienced with moonshiners and mountain natives, who are a lawless people, being wholly without moral consciousness. They many times threatened the lives of the surveying party, several of whom were killed. These mountaineers strenuously objected to all progress and civilizing influencers. On January 27, 1892, our subject, Mr. L. F. Gottschalk, was married to Miss Sophia M. Grayer of Ann Arbor, Michigan, one child being the result of this union, which died in infancy. Mrs. Gottschalk died April 29, 1893. On March 13, 1894, Mr. Gottschalk was married to Helena Hoehen of Columbus, Nebraska, and they are the parents of six children, who are named as follows : Louise, Irma, Margaret, Frederick O., Constance and Helen, all residing under the parental roof. Mr. Gottschalk is one of the few native-born pioneers of Platte county, Nebraska. L. Fred Gottschalk, our subject has been very prosperous and successful, and in 1908 built one of the finest houses in the city, on the homestead site of his father's original claim. In 1901, Mr. Gottschalk retired from railroad survey work, and is now engaged in local work and land deals. In his engineer work, Mr. Gottschalk has covered twenty-five states. Frederick Gottschalk, the father of our subject, was born in Germany, January 27, 1827, and came to America in 1853, locating in Pennsylvania for over two years, and came to Platte county, Nebraska, in 1856, where he purchased one hundred and twenty acres of land from the government, paying $1.25 per acre, which land is now incorporated in the city limits of Columbus. Mr. Gottschalk lived on this farm until the time of his death, August 18, 1905. He was a member of the very first group of settles in Platte county, and was closely identified with all pertaining to the interest and welfare of his county. On August 25, 1861, Mr. Gottschalk was married to Margetha Loy, in Columbus, Nebraska, Miss Loy being of German birth. Three children were born to them, two of whom are deceased, the surviving son being L. Fred. In reviewing the history of Antelope county, Nebraska, the citizens who have contributed to her welfare must be given special mention, and a prominent place must be accorded the gentle- man above named. Mr. McLain is a pioneer settler, coming here in 1883, and is one of the best known and most highly respected men in his region. He is a well-known farmer and stock man, and resides on section three, township twenty-seven, range seven. Mr. McLain is a native of Winnesheik county, Iowa, where he was born January 30, 1862. He grew to manhood in his native state, helping his father on the farm and attending the district school. In 1883, our subject started out for himself, coming to Nebraska, where he thought there were better chances for a young man to gain a competence, locating in Antelope county, on a homestead of one hundred and sixty acres. Here he engaged in mixed farming and stock raising, and has met with success. He first built a sod house, and lived in that three years, when he erected a frame house, which is a comfortable residence.